SignalLab .NET is a set of .NET 2.0-4.5 components for fast Digital Signal Processing (DSP) and data visualization. Allows fast complex signal manipulations with zero lines of program code. The library is fully multithreaded, utilizes very well modern multi-core systems, and runs at full native performance. Also includes a visual graphical editor for codeless development. - Signal Generators - Tone, Square, Triangle, ChainSaw, Jaehne, Random, Gauss, and user defined. - Transformations - Forward, and Inverse Fast and Discrete Fourier Transformations(FFT and DFT), Discrete Cosine Transformation(DCT) over real and complex data, Median, Hilbert, Haar, Goertzel and more. - FIR - Finite Impulse Response filter. - IIR and BiQuad IIR - Infinite Impulse Response filters. - Other Filters - LowPass, HighPass, BandPass, BandStop, DC Removal, Median, Delay and user defined filters. - Converters - convert between data types, polar, Cartesian representation, Conjugate, sample rates, power spectrum and more. - Noise Stats - Calculates the noise stats of a signal. - Arithmetic - Add, Subtract, Multiply, Divide, signals, apply constants and window functions. - Logger - stores Real, Integer or Complex data into a file. - Player - plays Real, Integer or Complex data from a file. - Switch - enables disables the data stream. - Scope Component - data plotting component. 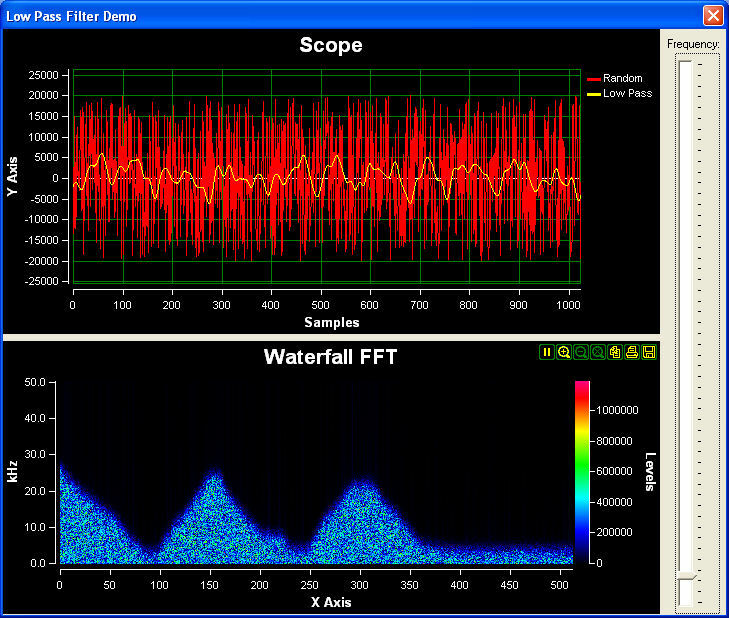 - Waterfall Component - Waterfall component for Spectrum, FFT data representation. - Composite components - Allows embedding component into each other.